Wooden board construction with shiny printed laminated design & brass handles. Large mirror on inside lid. Clockwork wound from the back, open the lid & the christmas tree figurine revolves as music plays. 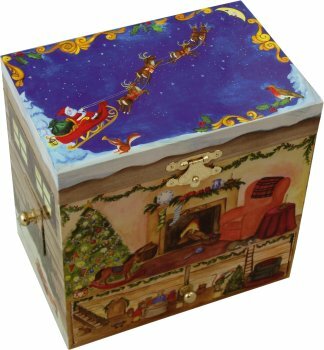 A magical Christmas music box perfect for the festive season. It's the night before Christmas and the stockings are hanging on the fireplace. The christmas tree is lit up with candles and decorated with candy canes and tinsel. The mice are even busy decorating their own tree under the floorboards, whilst Santa flies across the starlit night sky, ready to give presents to all those good little boys & girls! 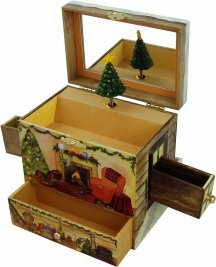 Open this christmas treasure box to hear the music play 'O' Christmas Tree' and watch the little christmas tree turn. This music box has four little drawers for secret storage ! Not suitable for children under 3 years old - contains small removable parts.